I had to bring out my rusty crochet skills for this challenge. Today it's Crochet at Every Inchie Monday. Of course, I couldn't find any of my tiny steel hooks so I scrounged around my many stashes because sometimes I use supplies for other projects, not necessarily what they are intended for. After my crochet piece turned into a small white wreath. If you squint hard it will look like that to you also. LOL I brought out some Stampin' Up red glitter paper. Great stuff, the glitter doesn't come off. I guess this appeared because there is so much Christmas everywhere already. I'm off to enter. I will say Happy Holidays to all, whatever you might celebrate! Of course it's a wreath! It was obvious even in the little picture that links to your blog! 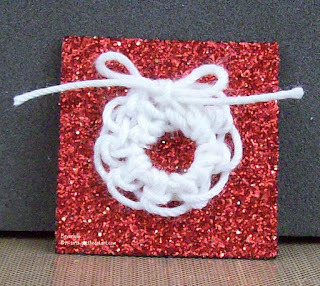 I adore this, the first thing I thought of was that you made a white Christmas wreath, no squinting needed! Sweet little crochet wreath. Perfect for the season.